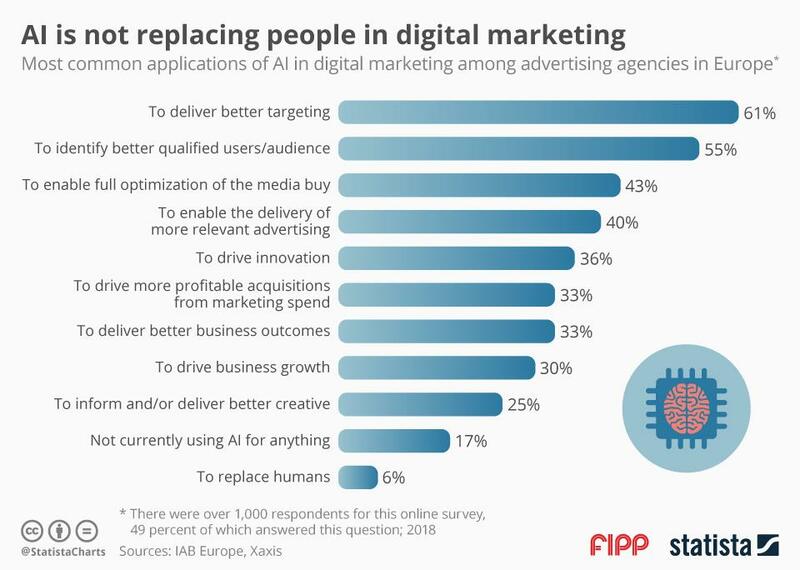 Chart of the week: AI is not replacing people in digital marketing Status: Artificial intelligence is taking off and transforming every industry, causing many people to worry that ever-improving intelligent systems will replace human workers. In 2019, the AI market is projected to grow by 154 per cent, and while this pivotal advancement is working its way into industries, not every field is adapting it in the same way. For digital marketers looking to implement artificial intelligence across different facets of their digital strategy, artificial intelligence does not look likely to take over from human workers. In a survey of digital marketing agencies conducted by IAB Europe and Xaxis, only six per cent of respondents said that replacing humans is the most common AI application for their agencies. Generally, using artificial intelligence to optimise business processes and target key audience members were the two most common applications for the technology in digital marketing agencies. Nearly six out of ten marketers said that they were incorporating AI systems into their agencies to deliver better targeting. An additional 55 per cent of respondents said they were using the technology to better identify users and audience.